The TN Khoshoo Memorial Award was instituted in 2004 to honour the legacy of the world-renowned environmental scientist, Dr. Triloki Nath Khoshoo. Dr. Khoshoo was first Secretary of the Indian Government’s newly created Department of Environment, in 1982. He played a significant role in the development of India's environmental policy. In the year 1996, along with Dr Kamaljit S Bawa, Dr Khoshoo founded ATREE. The annual T N Khoshoo Memorial Award is given to an academician or a practitioner whose work has had an impact in the fields of environment, conservation, or development. The TN Khoshoo Memorial Award was started by the Khoshoo family and ATREE to honour Dr Khoshoo’s legacy. Through the TN Khoshoo Endowment Fund, the awards, each year, encourages and promotes individuals for outstanding achievements in the field of conservation and sustainable development. The fund is sponsored by Dr Khoshoo’s family, ATREE, the Ford Foundation, the Institute of Rural Research and Development (an initiative of the SM Sehgal Foundation), and other philanthropists. The award consists of a cash prize of Rs 100,000. Dr. Rajeswari S. Raina, Professor at Shiv Nadar University’s School of Humanities and Social Sciences (SHSS) was awarded the TN Khoshoo Memorial Award, 2018 for her pioneering work in the field of sustainability. Instituted by Ashoka Trust for Research in Ecology and the Environment (ATREE) the award was presented to Dr. Raina in recognition of her work which uses interdisciplinary approach to agricultural research, bringing a scientific perspective to alternative, sustainable practices prevalent in the field. Through her research Dr. Raina has argued that agriculture exists in the environment and that without the resilient and sustainable ecosystems, there can be no agriculture. Dr. Raina works primarily on science-society issues keeping both sustainability and equity as important concerns. Her involvement and engagement have been at three spheres of work –education, science and knowledge generation and also outreach and policy advocacy. Accepting the award, Dr. Raina said, “Given the risks, uncertainty and ignorance that confronts sustainability science more women are needed in this field. We need `Science that makes sense together’ and not just `Science that speaks truth to power.” She further added that sustainability science should not fall into the trap of other disciplines and keep the dialogue with policymakers and practitioners open. The award ceremony was followed by a panel discussion on `Women and Sustainable Development’, moderated by Ms. Rohini Nilekani, Chairperson, Arghyam. The panel comprised women sustainability leaders from across sectors, including, Shruti Shibulal, CEO of Tamara Hotels, Pronita Saxena, Founder & CEO, Citizengage, Dr. Harini Nagendra, Professor of Sustainability, Azim Premji University and Dr. Jahnavi Phalkey, Founding Director of Science Gallery, Bengaluru. The panel discussed why women are still under leveraged despite being critical to supporting the three pillars of sustainable development - economic, environmental and social. According to Pronita Saxena, “While we all agree that women are part of the micro decisions, they need to be now included in macro decision making and governance. Jahnavi Phalkey also stressed on the need for including women in conversations and finding solutions for what primarily remains women’s burden – food, fodder and fuel. According to Harini Nagendra, it’s also a basic issue of fairness and justice to include women in the decision making process which has long been overlooked. She further cited Bengaluru’s Lake Movement as a successful initiative driven largely by women. The panel also highlighted the lack of sustainability entrepreneurs and how women have very few or no angel investors. The panel unanimously agreed on the need to empower more women to be key actors in sustainable economies and development. 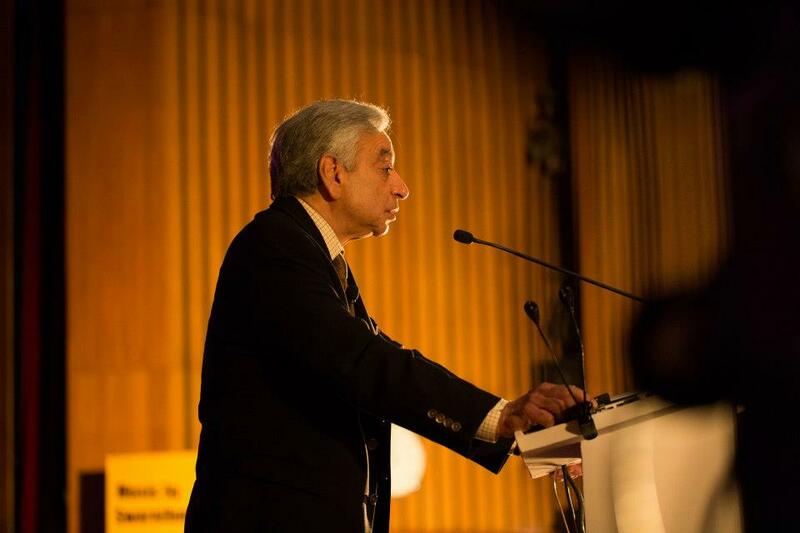 Dr Kamal Bawa, Founder Trustee and President, ATREE; Distinguished Professor of Biology, University of Massachusetts, Boston. 2016 K.J. Joy, Senior Fellow, Centre for Policy Research, New Delhi Panel Discussion on "Is interlinking of rivers the solution to India's water problems?" Director General, The Energy and Resources Institute, Delhi. Chairman, Intergovernmental Panel on Climate Change. Sonam Wangchuk, Founder, Students’ Educational and Cultural Movement of Ladakh (SECMOL) and a leading educational reformer and sustainability advocate, was awarded the TN Khoshoo Memorial Award 2017 on December 01, 2017. Instituted by Ashoka Trust for Research in Ecology and the Environment (ATREE), the award was presented to Mr Wangchuk for his innovative approach and pioneering work in the field of sustainability, at the TN Khoshoo Memorial Award and Lecture ceremony held at Indian Institute of Science. Mr Wangchuk started a project called `Ice Stupas’ to combat the water crisis in cold deserts. These conical mounds serve as mini-glaciers that melt slowly in spring, releasing millions of litres of water over the critical planting season and helping to ease local food and water scarcity under climate change. Currently, Mr Wangchuk is also building a crowdfunded alternative university campus – Himalayan Institute of Alternatives, Ladakh (HIAL) to engage youths from multiple Himalayan countries in Research & Development to tackle the issues faced by mountain people, especially in the domains of education, culture, and the environment. Accepting the award, Mr Wangchuk said, “Sustainability and conservation of nature has become a luxury among intellectuals. It should be taught to children in schools in ways that they develop a sentimental relationship with nature and respond to issues of ecological degradation. It’s unfortunate that not many people know the realities of present-day ecological issues. There is a need for those working in the field of ecology, environment and sustainability to disseminate knowledge in a way that is accessible to all section of society. We need to introspect the way we live and understand the impact it has on environment. We need to redefine and reinvent our values and keep it in harmony with nature.” The event also featured a guest lecture by Anshu Gupta, Founder, Goonj and the Ramon Magsaysay Awardee 2015. His keynote address explored the need to develop complementary currencies which create a meaningful barter, and look beyond money as the only resource to spur development. “Organisations working towards addressing some of the most pressing issues need to go beyond statistics to understand the core of the problem. This also requires prioritising key issues and accordingly allocating the resources,” said Mr Gupta. Speaking on occasion, Dr Kamaljit Bawa, Founder Trustee and President, ATREE said, “Sustainable practices are beginning to move from the periphery to the mainstream, and we need more people like Sonam Wangchuk and Anshu Gupta to be at the forefront of this change. We can no longer ignore the pressures that climate change and biodiversity loss are exerting on society and need innovative approaches to address sustainability issues. The TN Khoshoo Memorial Award and Lecture was created to promote, encourage and honour these efforts. Mr. K.J. Joy is the 2016 TN Khoshoo memorial award winner. As an activist researcher, he has worked for over 35 years on a variety of issues in the area of water management and governance as well as natural resource management. He is committed to the equitable, sustainable, and democratic management of these resources, towards which he has worked as a grassroots activist, interdisciplinary researcher, and policy advocate. He has worked on participatory irrigation and dam management, watershed development, biomass-based rural development, women’s livelihoods and water, conflicts around water, natural resource literacy, and water sector regulation and governance. He co-founded the Society for Promotion of Participative Ecosystem Management (SOPPECOM) in Pune and the Forum for Policy Dialogue on Water Conflicts in India, a network that seeks to understand and help resolve conflicts over water through research, dialogue and capacity building. Mr. Joy pioneered the formation of Water Users’ Associations (WUAs) in Maharashtra and worked with Bharat Gyan Vigyan Samiti to broaden the concept of watershed development. He has co-authored several path-breaking books, and co-edited two volumes on water conflicts and served on the Planning Commission’s Working Group on Water for the 12th Plan. The TN Khoshoo Memorial Award for 2015 was presented to Dr Navroz K Dubash, in recognition of the impact of his work on Indian climate change policy and the international discourse on global climate governance. Dr Dubash’s research has focussed attention on governance mechanisms to operationalize a co-benefits framework to simultaneously address growth and environmental objectives in developing countries like India. Not only has his research and policy contributions have informed and strengthened India’s position in the climate change negotiations over the last several years, but his work has also furthered the field of climate policy by combining elements as diverse as energy modelling, air quality health impacts, political science and institutional analysis. Vidya Athreya received the 2012 TN Khoshoo Memorial Award for her work on the social, cultural, biological and behavioral aspects of human-leopard conflict in human dominated landscapes. This followed from her interest in how wild animals live in human use landscapes, and the adaptation by people and animals to each other’s presence. Vidya Athreya is Research Associate with the Kaati Trust, Pune and also with the Centre for Wildlife Studies and WCS–India, Bangalore. She has worked with the Maharashtra Forest Department to decrease conflict by using knowledge-based management interventions. Her website, http://www.projectwaghoba.in/ provides relevant information on leopard ecology, conservation and management for the forest department and other stakeholders. Vidya Athreya did her Masters in Ecology from University of Pondicherry as well as from the University of Iowa. She is a member of the IUCN cat specialist group. Sandeep Tambe is Special Secretary in the Department of Rural Management and Development, Government of Sikkim. He has been responsible for the implementation of the Mahatma Gandhi National Rural Employment Guarantee Act (MGNREGA), for which, today, Sikkim has achieved 85 days of ensured employment, against the national average of 47 days. Sikkim also scores high on the transparency safeguards front, having a universal coverage of independent, quality social audits. Sandeep Tambe has been actively involved in the revival of springs, streams and lakes in drought prone areas of the state that has contributed rural water security. Before this, during his stint in the Forest Department and The Mountain Institute, Tambe was instrumental in initiating participatory protection of the biodiversity rich protected areas of Sikkim. This initiative, taken up in partnership with eco-development committees and local NGOs, has resulted in a measurable reduction of the threats to forests and wildlife. Sandeep Tambe is a member of the Indian Forest Service. He graduated from IIT Mumbai, did his MSc from the Indira Gandhi National Forest Academy (FRI) and has a Ph.D. from the Wildlife Institute of India. He is photography, alpine flowers and trekking enthusiast. Hemlata Pradhan’s aim is to ‘highlight India’s wild orchids and other plants in nature to bring about an awareness of what we are unwittingly losing…’ Hemlata Pradhan is a botanical illustrator, who comes from a family that has been raising orchids for five generations. She graduated with a diploma in Botanical Illustration with distinction from the Royal Botanical Gardens, Kew, and a Master's degree in Natural History Illustration and Ecological Studies from the Royal College of Art, London. She is the winner of the Royal Horticultural Society’s Gold Medal as well as the 18th world Orchid Conference Gold Medal for her paintings of Indian Jewel Orchids and the Indian Wild Orchids. Her works are housed at the Royal Botanic Gardens, Kew, England and were exhibited at the British Museum's Clore Education Centre in 2009. Her orchid paintings also appear on a set of six postage stamps of Bhutan. Hemlata Pradhan is passionate about the conservation of endangered orchids and other Indian plants. At present, she is involved in setting up a Natural History Art Institute in Kalimpong, Darjeeling, West Bengal, and getting Natural History Illustration recognition as a Fine Art subject in India. She is the First Honorary Secretary and Member of the ISROSG- Indian Sub-Continent Regional Orchid Specialist Group of the IUCN-International Union for Conservation of Nature and Natural Resources/SSC-Species Survival Commission and the Trustee President of the Himalayan Trust for Natural History Art, Kalimpong, Darjeeling Gorkha Hill Council, West Bengal, India. Joss Brooks came to Auroville near Pondicherry in 1970 to participate in the early pioneering work of the newborn community. In 1973 he established Pitchandikulam, dedicated to restoring the eroded 60 acres of Auroville Green Belt land. Now it is a vibrant forest with more than 600 species of plants, many with medicinal value, and a nursery that grows the endangered species of the almost extinct Tropical Dry Evergreen Forest found along the Coromandel Coast. In 1993, associating with the Foundation for Revitalization of Local Health Traditions (FRLHT), he developed the medicinal plant conservation park at Pitchandikulam. In 2002, the Nadukuppam Environment Education Centre was founded at a government high school near the wetland, from where a team of environmental education teachers from local villages began to work with school children, women’s groups and farmers to implement eco-restoration initiatives. In 2004, Pitchandikulam Forest Consultants was created to implement restoration work in other areas of Tamil Nadu, including the city of Chennai. A 12-acre garbage dump at Otteri in North Chennai has been transformed into a green lung of indigenous vegetation. In 2005, the Pitchandikulam team began work on a master plan for a 350-acre wetland site at the Adyar estuary. Over the following years, the typical urban wasteland of garbage and sewage has changed into an example of species regeneration, practical environmental education and citizen-government collaboration. The Adyar Poonga wetland restoration project is still very much underway, yet evolving into a crucial larger initiative to cleanse and transform the other polluted waterways of Chennai. Girish Sant is co-founder of Prayas, a non-profit organization based in Pune, whose Energy Group initiatives he coordinates. He has been involved in research, training, and advocacy on policy issues in the power sector for the last seventeen years. His interest in energy policy started with his involvement in the Sardar Sarovar Project and on nuclear power. His present work relates to issues of renewable energy policy, oil and gas policy as well as the international context of energy-climate linkages. He has a keen interest in realizing the massive potential of energy efficiency and pro-people energy policy, by promoting innovative policy options. 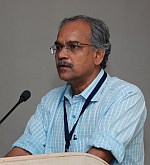 Girish Sant is a member of the Planning Commission’s Expert Group on ‘Low Carbon Growth’, and has also served on ‘Working Group on Power’ for the 11th Plan, PMO committee on the draft National Energy Efficiency Mission, Advisory Committee of Central Electricity Regulatory Commissions, and Supreme Court Committee on Energy from Municipal Solid Waste. In 2008, he received the Distinguished Energy Alumnus Award of the Department of Energy Science and Engineering, IIT Bombay. Prayas Energy Group does analysis-based advocacy to further public interest in the electricity sector. Prayas has played a significant role in advancing transparency and accountability among electricity regulatory commissions and continues to intervene in regulatory cases in the state of Maharashtra, appellate tribunal and in the Supreme Court. Prayas, along with the World Resources Institute (WRI) in Washington, coordinates the Electricity Governance Initiative, which is a global coalition of civil society groups committed to improving governance in the power sector. GirishSant underscored the collective nature of Prayas’ workby accepting the award as part of Prayas (Energy Group). Ashish Kothari is an environmentalist who works at the grass roots level with various people's movements as well as with various government committees and international associations. He is a founding member of Kalpavriksh, an Indian environmental NGO active on conservation and livelihood issues since 1979. The T. N. Khoshoo Memorial Award in Conservation recognises not only Ashish's outstanding contributions to conservation, but also those of Kalpavriksh. Ashish's interest in environmental and developmental issues related to big dam projects motivated him to participate in people's movements such as the Narmada Bachao Andolan and at the same time be a member of the Environmental Appraisal Committee on River Valley Projects, Government of India, from 1993 to 1995. He has contributed to environmental policy formulation and governance by being member of various influential government committees. He has advocated a socially and culturally more sensitive process of wildlife conservation for the last twenty years. He has been able to direct this interest to serving as the Co-Chair of the IUCN Inter-Commission Theme on Indigenous/Local Communities, Equity, and Protected Areas (TILCEPA) and other such similar groups. Over and above his role as Coordinator, Project on Community Based Conservation in South Asia, Kalpavriksh, and International Institute of Environment and Development, London, Ashish has associated with other Non-Governmental Organisations (NGOs) such as Greenpeace, Centre for Communication and Development Studies and Bombay Natural History Society, in various capacities. Ashish is also a prolific writer, having authored or edited 25 books, and over 150 articles, on environment, development, and conservation issues. Charudutt Mishra is a conservation scientist who has tried to understand and work on various areas related to the usage of natural resources, the human impacts of natural resource use, and human-wildlife conflicts. He is the Science and Conservation Director of the Snow Leopard Trust (SLT), and one of the founders of the Nature Conservation Foundation (NCF). He served as NCF's Executive Director between 2002 and 2008, and also headed the India Program of the SLT. He serves on the editorial board of the journal Animal Conservation and is a member of the IUCN's Cat Specialist Group. He has a Ph.D. in Ecology and Natural Resource Conservation from the Resource Ecology Group, Wageningen University (The Netherlands). Charu's chief academic interests lie in understanding pastoralism and resource use, human impacts on wildlife, ecology of human-wildlife conflicts, large herbivore community ecology, and carnivore ecology. Charu also tries to dedicate time and effort to extend conservation science for societal welfare, on-ground conservation, and policy. His recent work involves setting up community-based wildlife conservation and conflict-resolution programs, conducting research and exploration, teaching and guiding Ph.D. students, and working with governments to set up wildlife reserves and formulate conservation policy. His current work spans the Himalaya and several Central Asian countries where he is involved in guiding research and conservation efforts. He was involved in post-conflict wildlife assessments in Afghanistan on behalf of the United Nations. Expeditions led by him in Arunachal Pradesh led to the discovery of the Arunachal macaque, M. munzala, a primate new to science. Charu is a recipient of the Whitley Gold Award in 2005 and the Golden Ark Award in 2008. A repository of knowledge on the flora and fauna found throughout the Himalayas, Rebecca Pradhan, can easily recount the genus and species of over 90% of Bhutan's plant life off the top of her head. Rebecca is a true naturalist, working and writing about birds as easily as about plants. While her academic qualifications include a B.Sc and a post graduation in Library Science, whatever she has learnt about plants and animals has been through a process of self-education. Impressed by her knowledge, Rebecca was invited to spend two terms as a Mercer Fellow of Arnold Arboretum in Harvard University, Cambridge, Massachusetts. With her vast botanical knowledge, innate skill and passion, Rebecca has already impacted conservation efforts in Bhutan. Originally from Kalimpong in India, Rebecca, has been living and working in Bhutan for many years. Starting her career as a school teacher in 1972, Rebecca moved on as the Head of the Herbarium and Forestry Research Library, Department of Forestry, Royal Government of Bhutan in 1985. Since 2000 she has worked as an Ecologist with the Royal Society for Protection of Nature (RSPN), Bhutan, where she is at present involved with the White-bellied Heron Project and in conducting biodiversity surveys of RSPN conservation areas. Over the years, Rebecca, has also been closely involved in a number of surveys to study and document the flora and fauna of Bhutan. Rebecca has written extensively about the extraordinary biological richness of the north-eastern Himalayas, and particularly Bhutan, a region of which our knowledge is very meagre. She is the author of the books 'Wild Rhododendrons of Bhutan' and 'Threatened Birds in Bhutan'. She is also the principal compiler and data contributor of the Important Bird Areas of Bhutan for the Birdlife Conservation Series 'Important Bird Areas in Asia.' She has also produced a DVD on the ecology of the white-bellied heron. Rebecca has done much more than her written papers would indicate; for example she has discovered new species of bamboos, oaks and other plant groups. In her work she is involved with wildlife officials, community members and non-governmental organisations, and also teaches school children about wildlife in her spare time. Rebecca's immense knowledge of the biota and ecosystems of the eastern Himalayas is vital to the future of Bhutan's resources. And she herself is committed to advancing further the knowledge about and the conservation of the pristine forests of Bhutan. In 2010, ATREE started the TN Khoshoo Ecology and Environment Award for Schools.The new award called for action on environmental issues, and was announced in Delhi and Bengaluru. The idea was to reward initiative/ action on local environmental issues and so seed environmental consciousness. The award was designed in partnership with The Teacher Foundation, Wipro, IAIM-FRLHT and Pravah, and recognised schools for catalyzing and enabling environmental thought and action among its students. In 2011, the TN Khoshoo Ecology and Environment Award for Schools became part of the Wipro earthian awards, and is now called the TN Khoshoo-earthian Trophy. This strategic partnership with Wipro is the result of a shared vision of the role of youth in potentially advancing conservation thought and action in routine decision making. The TN Khoshoo-earthian Trophy recognizes one school and one college from among the short-listed earthian winning submissions, for higher degree of feasibility, practical implement-ability and contextual understanding. ATREE is also one of Wipro’s knowledge partners in the fields of environment, development and conservation, for the earthian’s Continuous Engagement Programme (CEP). The CEP is the second part of the 'earthian Sustainability Program for Schools and Colleges'. It will be a process of continuously engaging with the winning institutions on multiple fronts to develop capacities for activities around sustainability. The purpose of this investment in developing next generation capabilities by earthian and its partners is to help develop an interdisciplinary view of the problems of environment and development, and encourage rigour and critical thinking for action. The TN Khoshoo Earthian Trophy for schools was distributed to a school and a college at the Wipro Earthian Awards ceremony, held at Wipro's Sarjapur campus in Bangalore on 6th February 2016. The TN Khoshoo Earthian Awards, this year, were bagged by the Government Secondary School, Bongten and Xavier University, Bhubaneswar. Students of the Government Secondary School, Bongten, West Sikkim, won the award for a project titled 'Environment as a shared space'. The students spent a year surveying 45 flora species, and the various interactions they have with other organisms, in and around their school campus. They also conducted a socio-economic survey recording the community's awareness on ecosystem services. They ended their report with a case study on paddy cultivation - a major source of income for the community, focusing on the different strains of rice, cultivation techniques and fertilizers used by the community. The team's suggestion included a switch to organic farming practices and adopting farming techniques that would boost native rice strains. Winners in the college category, the Xavier University, Bhubaneswar, Odisha, developed an analytical report on solid waste management in their city. They identified the main sources of solid waste, e-waste, plastic waste and bio-medical waste and the key challenges associated with them. The team devised a model that would assist the municipal council in segregation, collection and treatment. This report has been presented to the State Municipal Council in an effort to work alongside each other. In addition to this, the team also audited the University's energy and water consumption and submitted a list of recommendations to students and the governing board - with a special emphasis on behavioral changes as a collective. The winners were awarded a plaque and ATREE's coffee table books -The Himalayas and Sahyadris at the event. The TN Khoshoo Earthian Trophy has been a part of the Wipro Earthian Awards since 2011. This partnership with Wipro is the result of a shared vision of the role of youth in potentially advancing conservation thought and action in routine decision making. Each year the TN Khoshoo-earthian Trophy recognizes one school and one college from among the short-listed earthian winning submissions, for higher degree of feasibility, practicality and contextual understanding. The TN Khoshoo Earthian Trophy also commemorates the legacy of one of India's leading environmental scientists, Dr Triloki Nath Khoshoo (27 April 1927-10 June 2002). Dr Khoshoo was also the founder trustee of ATREE and an able administrator, who started his career as co-founder of the Department of Botany at the Punjab University, Lahore, which moved to Khalsa College, Amritsar, soon after the partition of India. Dr Khoshoo became the first Secretary of the newly created Department of Environment of the Government of India in 1982. He joined the Tata Energy Research Institute as a Distinguished Fellow In 1985 and contributed to public policy discussions at national as well as international forums. He was awarded the Padma Bhushan in 1992 and the Sasakawa Environment Prize by the United Nations Environment Programme in 1996. Dr. Khoshoo was a prolific writer. Over the course of five decades, he authored more than 250 research papers on plant genetics and evolution, biomass, energy, forestry, conservation, etc, and wrote wrote seven books and edited eleven more on a wide range of subjects. His book 'Mahatma Gandhi: An Apostle of Applied Human Ecology', published in 1996, was widely applauded for his interpretation of the practical relevance of Gandhian views. The project required hands-on skills in educating residents on issues of waste management; persuading and motivating skills to convert them to this practice; partnering capabilities to create a chain of movement of waste from a house to recycled or useful products like compost, and thereon to its buyers. Why Rajalakshmi Engineering College, Chennai got the TN Khoshoo-earthian award: This project is an example of household level outreach with ripple effects in community and surroundings. It is a good example of local autonomous action and community participation. The college carried out a practical activity to its logical end, with little or no loose ends. Why KK English High School, Bengaluruget the TN Khoshoo-earthian award: The school demonstrated commitment to action that was demonstrated in scale, thoroughness of action and length of project in time. The project included all students and staff, not just students participating in the competition. The project was carried out for the entire year and is evidently part of school practice before this as well. 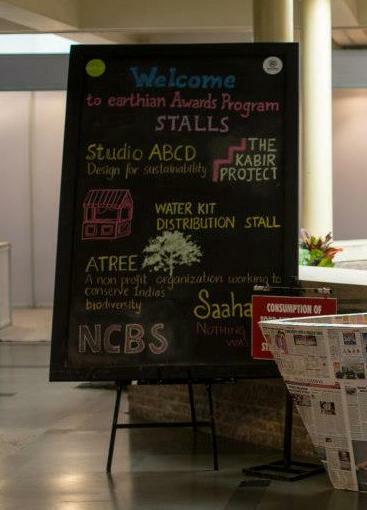 Why Sakar English School, Ahmedabad get the TN Khoshoo-earthian award: For being able to break up the problem of city into workable components, thereby providing a practical handle that could lead to immediately do-able/ practicable measures. Project: Integrating solid waste management and organic farming, within the theme: cities and communities, agriculture, role of policies, regulations. The IIM paper addressed the issue of inorganic farming and associated deterioration of soil quality, as well as perceptions that discourage farmers from using organic methods. A parallel investigation into the problems besetting solid waste management in Kerala lead the team to create a Mobius of one issue being part of the solution for the other issue. The IIMK team propose a hub and spoke system of waste collection, its treatment and disposal as organic manure and pesticide. The IIMK team members wereSivaharsh S, Raj B, Praveen S, Paresh Mali, MonicaPachori. Read the full project submission. Rishi Valley team:ArjunAshoka, AryamanJal, IshaanAgrawal, SamvitSengupta, Nihal Saldana, KabirSrivastav, DevdarshanBastolaTanmayBedi are the group that made up this team. 2010-2011, the first year of the TN Khoshoo Ecology and Environment Award for Schools. The award was launched in Delhi and Bengaluru in early 2010. Coordinating organisations–Pravah, in Delhi, and ATREE, in Bengaluru, started their interactions with schools in July 2010, briefing schools on the long-term objectives of the school awards, and guiding them through the processes for participation.The efforts of the students, schools and the organisers were showcased in interactive Environment Melas in Delhi and Bengaluru on 24th January and 28th February 2011 respectively. The winners of TN Khoshoo Ecology and Environment Awards for Schools 2011 were announced here. The criteria for winning were impact, sustainability of the idea, replicability, and creativity. For more on the first awards. Dr. Triloki Nath Khoshoo (27 April 1927-10 June 2002), founder trustee of ATREE, was a world-renowned environmental scientist and an able administrator. Dr. Khoshoo started his career as co-founder of the Department of Botany at the Punjab University, Lahore, which moved to Khalsa College, Amritsar, soon after the partition of India. After a brief stint as Chairman of the Botany Department at Jammu and Kashmir University, he joined the National Botanical Gardens, Lucknow, in 1964, as Assistant Director. He soon became the Director, and due to his untiring efforts, the institution rose to the stature of being the National Botanical Research Institute in 1978. Dr Khoshoo became the first Secretary of the newly created Department of Environment of the Government of India in 1982, with the responsibility of developing an environment policy for the country. In 1985, he joined the Tata Energy Research Institute as a Distinguished Fellow and contributed to public policy discussions at national as well as international forums. He was awarded the Padma Bhushan in 1992 and the Sasakawa Environment Prize by the United Nations Environment Programme in 1996. Dr. Khoshoo was a prolific writer. Over the course of five decades, he authored more than 250 research papers on plant genetics and evolution, biomass, energy, forestry, conservation and, the utilization and management of natural resources. He has written seven books and edited eleven more on a wide range of subjects. His book 'Mahatma Gandhi: An Apostle of Applied Human Ecology', published in 1996, was widely applauded for his interpretation of the practical relevance of Gandhian views.